I love reading and I love writing. As a child I could read for hours and verbal expression has always fascinated me. At university I was secretary of a student board and wrote all kinds of things in the newsletters. To me, writing is a way to discover what I know and what I think about a subject. And when other people read it and discuss it with me, I discover more and it helps them to do their own discoveries. Writing a website on Xi and XIPs was one of the ways to develop my own knowledge on the subject. It made it more easy to start writing a book, or articles. My first Dutch book was published in 2007. That same year my first English article was published in ‘Advanced Development, a Journal on Adult Giftedness’. This menu-item offers information on my publications in the English language only. For more information on my Dutch publications, please look up my Dutch website. In 2007 my article How to Charm Gifted Adults into admitting Giftedness; their Own and Somebody Else’s was published in the American journal ‘Advanced Development, a Journal on Adult Giftedness’. The article can be downloaded on this page. 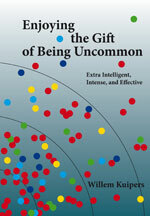 My English book Enjoying the Gift of Being Uncommon, is also presented on a separate page, offering links to order the book as a paperback or as an e-book.